This image was simply titled Bethlehem Steel in the Library of Congress archive, and had no supporting information other than it was published in the period 1910-1920. Interestingly, the engine has written Washington Terminal on the tender, which is confusing given the title of the picture. Wikipedia tells me that the Washington Terminal company provided shunting (or switching in American parlance) services for railways operating into the Washington Terminal railway station. 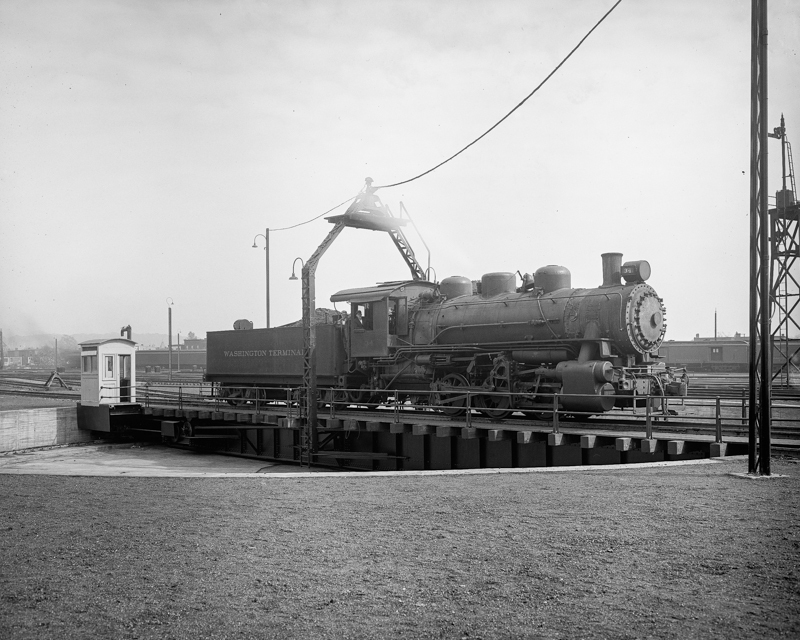 This photo has also been posted on shorpy.com, where someone has commented that it rather Bethlehem Steel being the location, it is probably the turntable that is the product of Bethlehem Steel. While clearly a staged photograph, it is an interesting one nonetheless. If you look closely at the 100% crop, you will notice that one of the crew is wearing a bow tie – surely this wasn’t regular attire for footplate crew on the railway?!?! !